Considering the extravaganza of food, Dubai implies diverse tastes. Dubai is an undeniable coliseum for international cuisines where many flavors from various nations and cultures assemble delightfully. Like Chinese, Japanese, French and Italian flavors, Dubai also grasps the Indian fare pleasurably. There are various Indian restaurants in Bur Dubai that offers a momentous cluster of true Indian flavors to Dubai food lovers. If you are desiring for a lip-smacking Indian cuisines while yearning for typical Desi Indian flavors, then Dubai has a comprehensive latitude of Indian eateries that are primed to satisfy you with their well-cooked, well-organized and well- served Indian food. Extending from traditional bistros that serves authentic Indian recipes, to radical mishmash brasseries, that serve contemporary Indian sustenance, Dubai has everything to satisfy your spilling taste buds and to delight you. There are numerous Indian restaurant located in the district of Bur Dubai specifically, which offer you quality food at highly affordable price value. Here cited are the five best Indian Restaurants in Bur Dubai to try. Gazebo is a captivating terminus to relish the epic and royal Indian cuisines that are prepared over the outlines of authentic Mughal kitchen and savors. Gazebo has a lavish menu and flashy ambiance to provide you a grand indulgence. The place offers you a wide range of delectable food delicacies that are amazingly flavorful; yet some of their signature cuisine includes Murgh Seekh Bharwan, Raan-e Sikandari, Handi Gosht, Lobster Tawa Masala and Biryani. It also offers a delicious array of traditional desserts such as Gajar Halwa, Gulab Jamun, Kheer, etc. Gazebo, one of the recommended Indian restaurant in Bur Dubai, is located on Kuwait Street, Al Mankhool – Bur Dubai. Raaga is another splendid alternative to set out upon having Indian food in Bur Dubai. The spot is ideal for relishing a broad choice of traditional Indian dishes in a relaxed and spectacular eating settings. Raaga offers an awesome array of customary and contemporary Indian cuisines and snacks, deserts and refreshments. The feeling is energetic, reviving and satisfying to fill your heart with joy through a perfect Indian meal in a consistent devouring vibe. Raaga is situated opposite to the BurJuman Centre, near Avenue Building, Al Karama, Dubai. Patiala House also stands out amongst the most renowned Indian restaurants in Bur Dubai and snack points. Patiala House is impeccable to appreciate an informal breakfast or a late night eat with traditional Indian tucks. The place has got a casual dining setting with lively vibe and offers you a wide range of Indian and North Indian food menu. Most of all, the place is highly affordable as it will cost you around AED 75 for two persons. This could be your dine in option if you are driving from Al Karama to Bur Dubai, as it merely going to take 8 to 10 minutes by car. It is the shop 15, situated in Al Sharafi Building, opposite Karama Post office, near Day to Day Supermarket, Al Karama – Dubai. Doner Kebab is situated at, Jumeirah Lake Towers, Media City, Business Bay, Mirdif, Al Barsha, TECOM, Dubai Marina, Silicon Oasis and City Tower. This Indian restaurant in Bur Dubai could be your choice if you want to eat traditional rich Desi food from India. Pind da Dhaba has an exclusive Indian and North Indian menu which offers you a wide range of vegetable, meat and seafood cuisines. The place is quite traditional and lively, and you will feel at home in their friendly and colorful atmosphere. It offers you to choose from their wide range of traditional cuisines, fast food and side options. This place is also highly affordable and will cost you around AED 100 to 120 for two persons. It is situated behind Jumbo Electronics, Al Karama – Dubai. 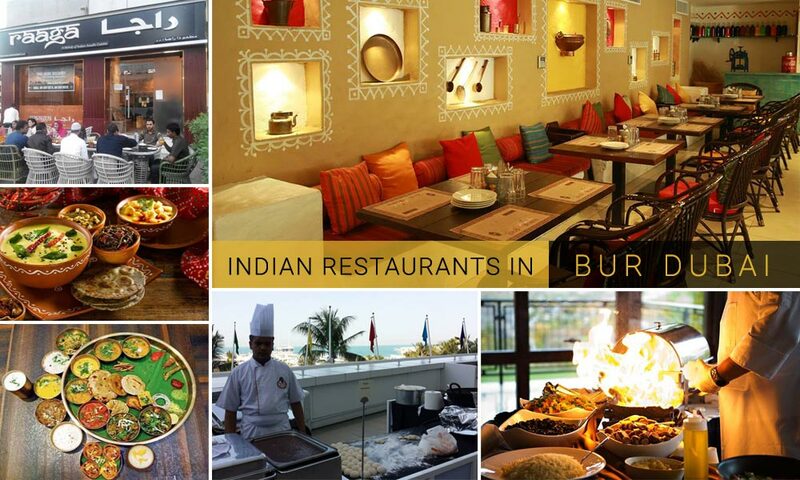 These are some of the top quality Indian restaurants in Bur Dubai, you should try. These eateries offer authentic Indian food in a wide range of menu to choose from. If you have tried one of the above mentioned Indian restaurants in Bur Dubai and would like to share your experience, please add comments below.